Are you considering what material to use for the roof or siding of your new barn? Metal has become an increasingly popular option in recent years. Metal roofing panels are durable, cost-effective and available in a wide range of designs that will likely suit the needs of any property owner. Metal roofing is available in a variety of colors and styles to match the aesthetics of your property. Metal panels are virtually maintenance-free once installed, with paint warranties on some available versions lasting as long as 40 years. Standing seam metal roofs are also ideal for roofs with a lower pitch where asphalt shingles will not perform well. While metal panels are most often thought of as being used for roofing, they can also be used as durable siding. The metal panels can be pre-sized to limit cutting during installation and are easy to put up at your structure. As with roofing, metal siding can easily last for decades – if not a lifetime. Metal also offers some environmental benefits when compared to other materials, like asphalt shingles. Since metal panels are available in light colors, they are a great option where summer heat is a concern. Since the lighter colors reflect sunlight, barns and other outbuildings with metal roofing stay much cooler during warm weather. The combination of recycled materials and panels that last for decades reduces the environmental impact of construction or remodeling of barns and outbuildings. Another advantage of using metal panels is rainwater harvesting. Unlike asphalt shingles, metal panels are a safe option for collecting rainwater. Reduce runoff into the pasture and collect drinking water for livestock or channel water away from structures more effectively with metal roofing. 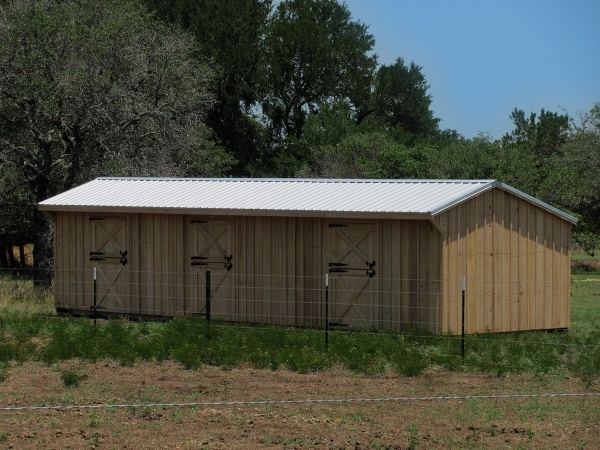 Looking for a pre-built barn or outbuilding solution? Deer Creek Structures offers custom horse run-in sheds, portable shelters and barns. Call us today at 254-546-2276 to learn how we can help with your farm structure needs.